One of Hope's biggest goals is to be "one of the team". I am constantly looking for opportunities for her to "join in" and work with a group. But this year, she found her own opportunity - one that I didn't think was possible. 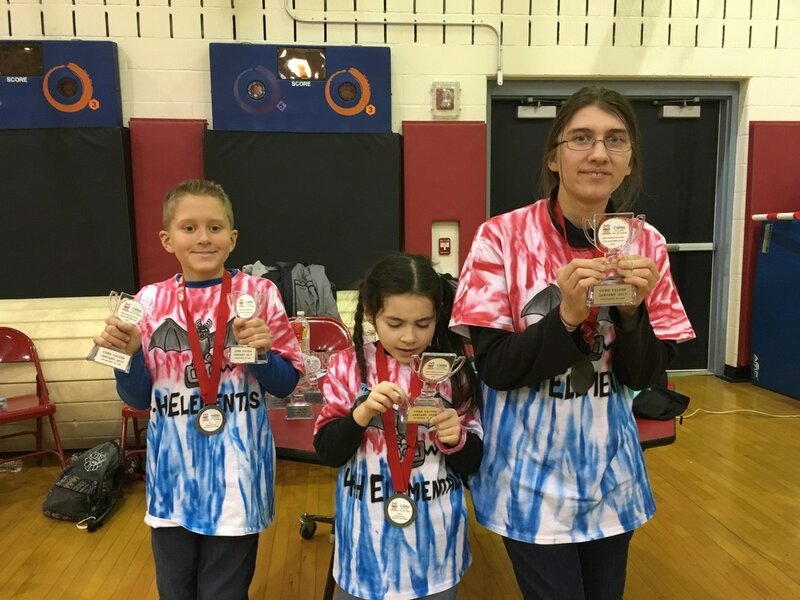 For the last 4 years, her older sister Julia has participated in First Lego League Robotics. An awesome, fun and very competitive Robotics competition. For the last 2 years, I have coached Julia's 4-H team because, well, no one else wanted to. lol This year, our team was a small group of 2 - Julia and her friend Rich. As we started our practices, I noticed Hope wanted to be around the action. Now usually, Hope will go about her own play when Julia's friends are over the house. Yet this time she wanted to be with everyone. At first, we all thought is was cute how she started building some of the mission parts, but soon we realized she was doing so much work, I would have to list her as a team member! 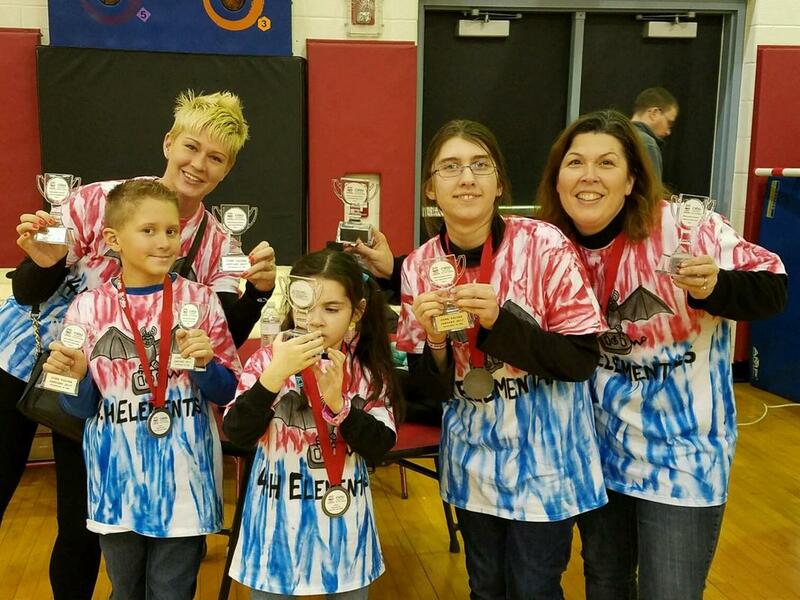 As a team member, she would have to participate in all 3 aspects of FLL - Robot game, Core Values & Project. Well she managed to hold her own throughout the season. No one had to teach her how to build Legos, but Julia did show her the beginnings of programming and running the EV3 robot. Rich taught all of us about bats (that was our project theme). The 3 of them worked together so well. For the first time, I really saw Hope as a part of a team, working together. It was an awesome feeling. As we got closer to the competition, the team began working on their presentations. Each of the 3 areas of FLL must be presented to the judges n a structured format. How could they include Hope? I e-mailed the head organizer and explained the team's dilemma. 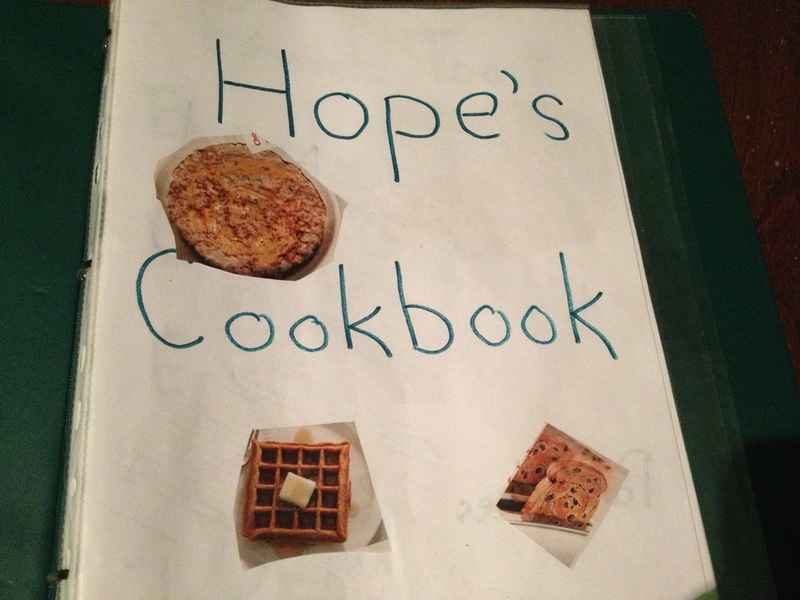 Hope is mostly non-verbal as far as spontaneous language and while she can read almost anything, she has never presented anything without adult assistance. So I asked if it was okay to have the rest of the team present for her. He responded that the entire team should share in the presentations, so that gave our team a new challenge - giving Hope the best opportunity to present. They decided to let her present the Core Values poster. It would have to be a 2 minute speech describing a poster the team made. The team wrote her speech and they practiced how they would walk into the room and get Hope into position to present. FLL has a strict rule - NO ADULT HELP. So the kids were on their own once in the classroom. They decided to give the judges a copy of Hope's speech just in case they couldn't hear her or understand her. Julia would help Hope take a seat and then hand her the speech when it was time to begin. After, Julia would walk her over to me while Julia and Rich finished the question & answer time. On the day of the competition, we found out we were presenting Core Vales first. I was glad that Hope would be fresh and ready. We all walked into the classroom and ... it went as best as it could. I started to cry watching Hope present and seeing the support she got from Julia and Rich. I have to admit, I didn't think I would ever see Hope as a part of First Lego League. I loves when she proves me wrong. Oh... and the icing on the cake? Our team won the Core Values Category!!! Many people feel that I am completely insane taking Hope to WDW. A child diagnosed with severe Autism and Sensory Integration Disorder - "Are you crazy?" they ask. But I have found Disney World a place where magic does happen. It takes some serious planning - but I find that fun! ​I started writing WDW Trip Reports on WDW Magic Boards http://www.wdwmagic.com so that parents with Autistic children like Hope see how truly magical a WDW trip can be. For us, Hope always does something amazing there - we consider it a week of intense therapy. Here are my Trip Report links - I hope some of you will find them helpful! Ever since Hope was two, her SEIT has always encouraged us to set "target goals" for her. A target goal is a very specific goal or behavior you want to work on. Whenever her SEIT came up with a new target goal, she would scribble it on a piece of paper and hang it on my refrigerator door. If you are like me, the refrigerator door is prime real estate. I constantly glance there throughout the day. 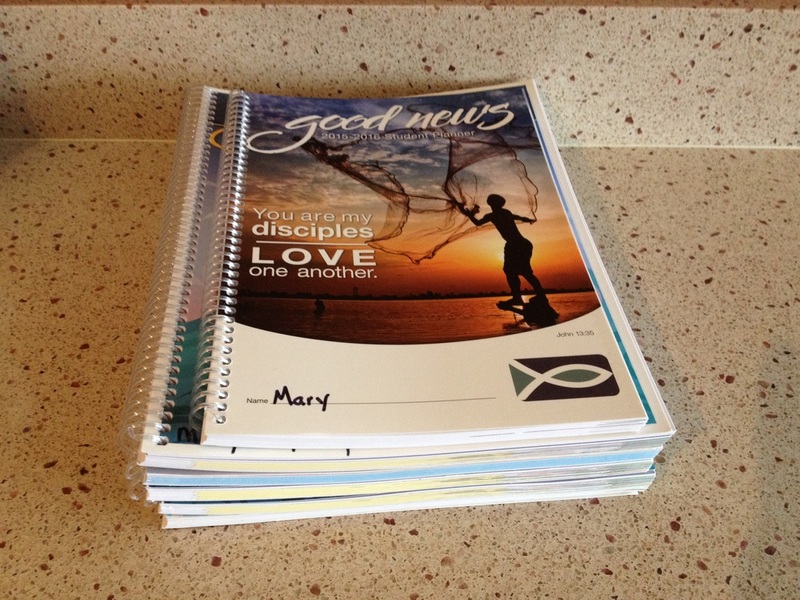 If I were to keep Hope's goals in a binder or planner, they would not get the attention they deserve. Hence, Hope's refrigerator goals were born! Target goals are a very important component for me to help me keep my sanity and have been extremely helpful when teaching Hope. For example, one of Hope's target goals right now is to respond to her name when playing. So if we sit down to play a game of "Don't Break The Ice" she may have a hard time, taking turns or following directions, but the important thing for me to keep in mind is that I am working on one goal - responding to her name while we play the game. At the end of playing, the game itself may not have gone as well as I would have liked to - but if I got her to respond to her name while we were playing, then it was a success! Sometimes it can be so hard not to see the whole picture. Imagine that you are having your entire family over for dinner the next day and realizing that your kitchen is a complete disaster - dishes everywhere, dirty floors handprints all over... where do you start? You just want to conquer everything and have the kitchen clean. It would be so easy for me to freeze and not be able to find a starting point. The result? the kitchen doesn't get clean at all. So instead of seeing the whole picture - a disgusting kitchen, force yourself to just focus on one small aspect - wash the dishes. After you wash the dishes, set another target goal - sweep the floor. Then just keep going one small task after another. Soon, you will see your kitchen start to take shape and before you know it, you will have a sparkling clean kitchen to be proud of. 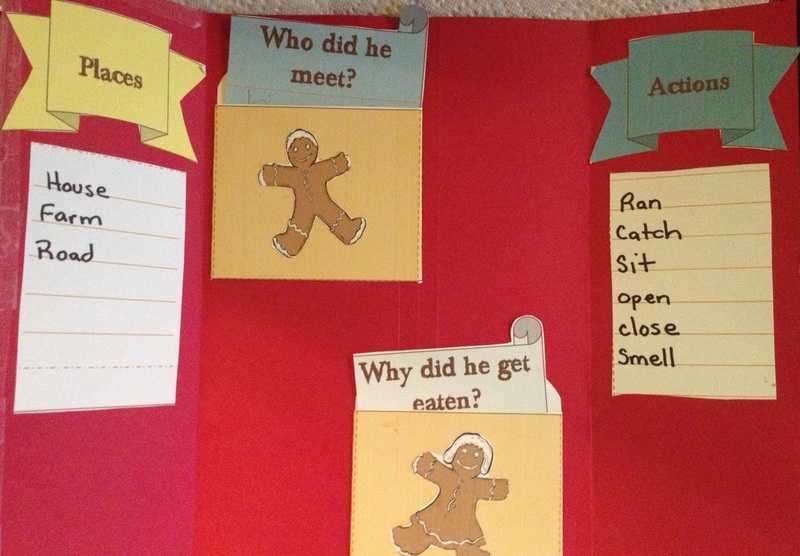 The great thing about target goals is they can always change and evolve to meet the needs of your child. Hope's target goals are constantly changing. But having them on my refrigerator is a constant reminder of what we are currently working on. Below I have attached some samples of our current target goals and also a blank one that can be printed out and filled out. Have fun hanging them on your refrigerator. Is anyone else bit by the planning bug this time of year? It never fails, May arrives and I jump into preparing for the next school year. 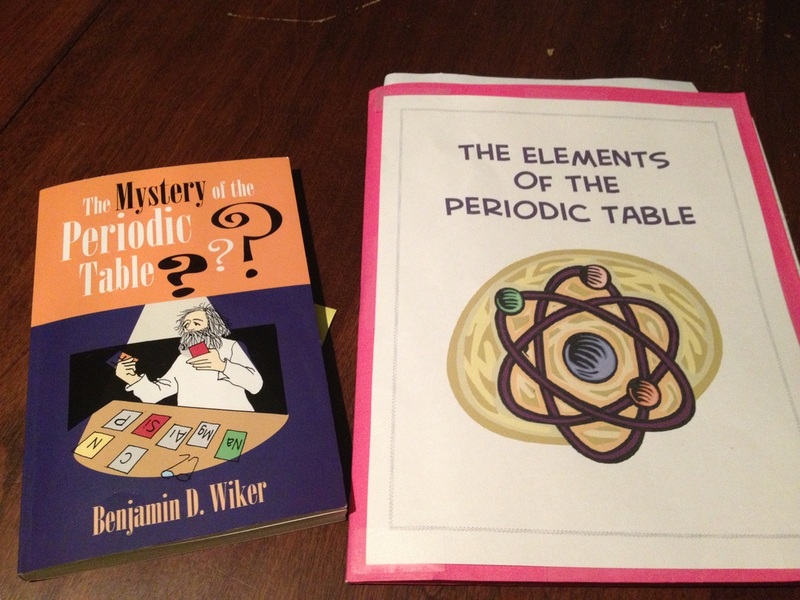 Books to buy, curriculum to tweak, and of course… plan books! I have to admit, I never think to change and try a different one. They really work for us! Of course by the picture, you may think I have 6 children – but no they are all for my 2 girls. 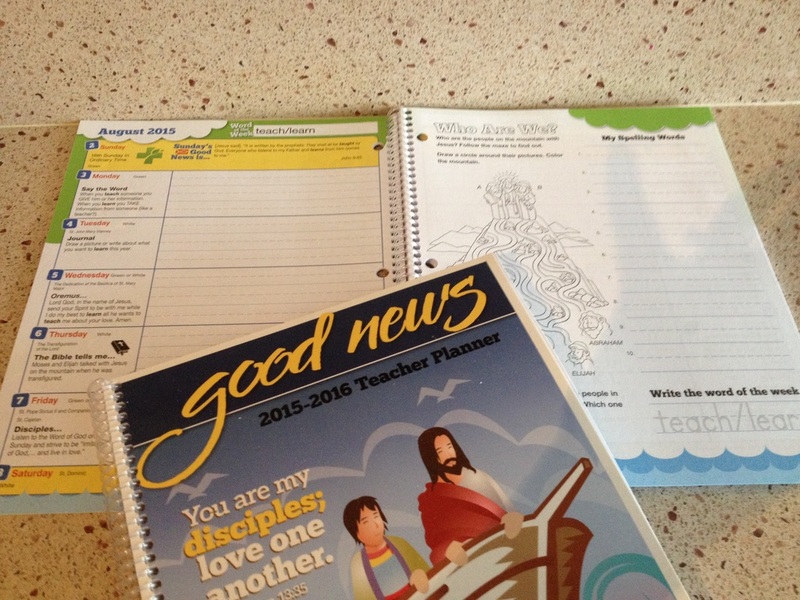 The small one on top is Good News' Jr. High & High School planner. I use this for my personal planner. This year I also got one for Julia who I think is old enough now to start to organize and keep track of her activities and events. 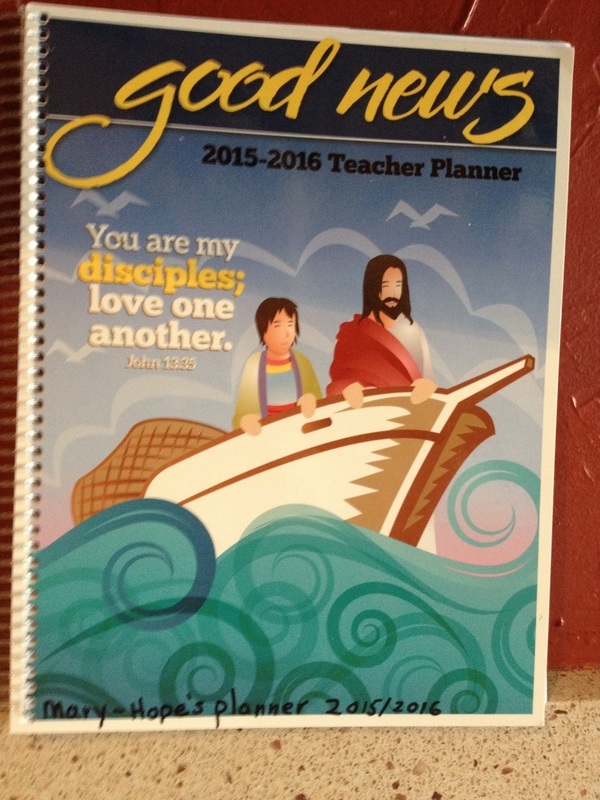 I have a separate planner for Julia & Hope to keep my lesson plans and goals. Instead of filling in the entire year’s daily lesson plans, I actually write in as we go - a daily check list. It helps me keep things organized when I have to write my quarterlies. Plus it helps me to know what we have accomplished. 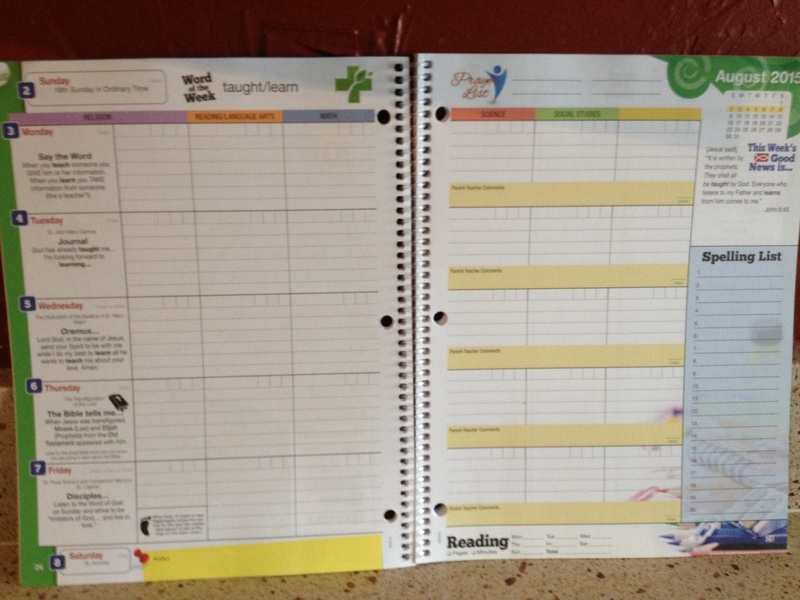 I love that they have a monthly view – where I can write my goals and objectives for the year and then on the weekly sheets, I can write in more detail when we accomplished. 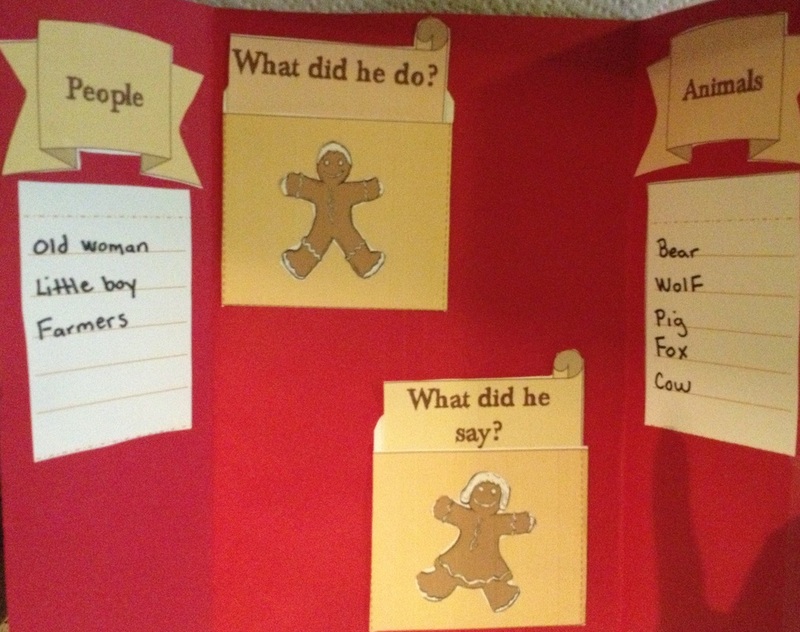 I also like that the subjects are labeled. I use the last column for Art/PE/Music. 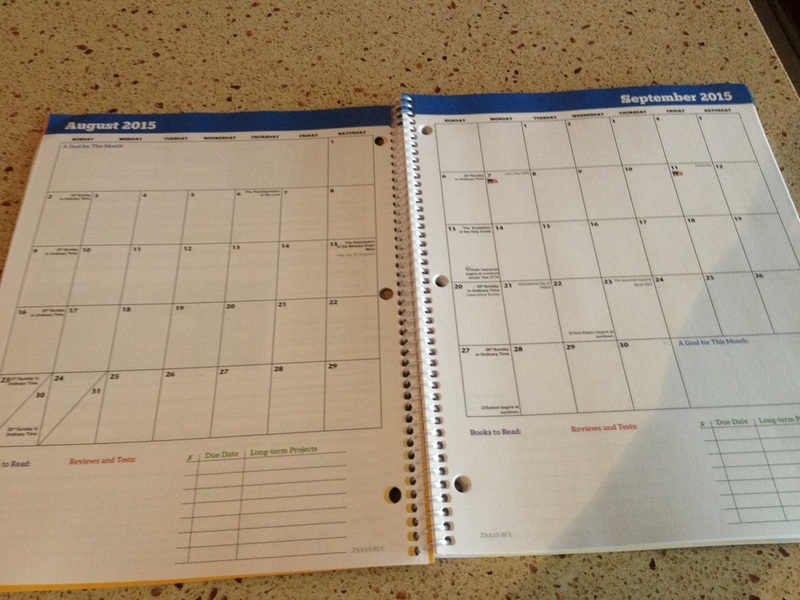 This year I also purchased a planner for each girl. Julia is getting to the point of doing more research and longer term projects – so I think this could help her manage her time better. For Hope, I think it will be a good way to reinforce the calendar and be a strong visual when we are working on different topics, keeping track of important days and going on trips. 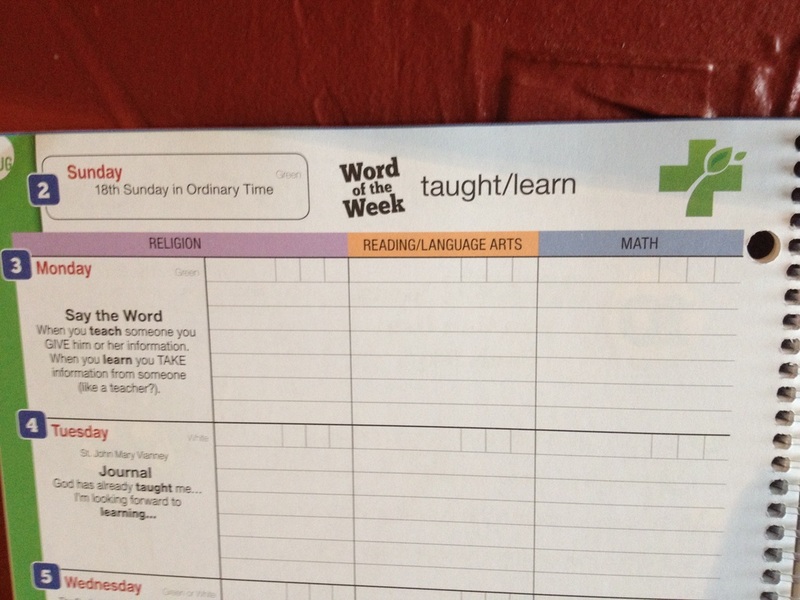 Plus the Primary planner has a short puzzle or game for each week that is nice. 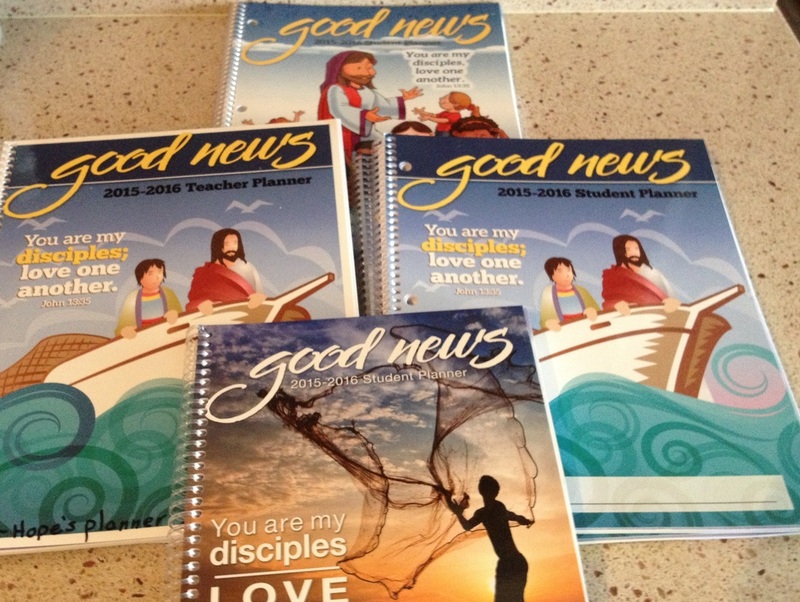 So there you have it… 6 plan books, 2 children and one crazy homeschool mom. On July 1st, Hope will become an official homeschooler. Now for the big decision, should I report her as Kindergarten or first grade? In NY, Kindergarten is not mandatory. Reporting is determined by compulsory age, therefore I can decide between the two grades. 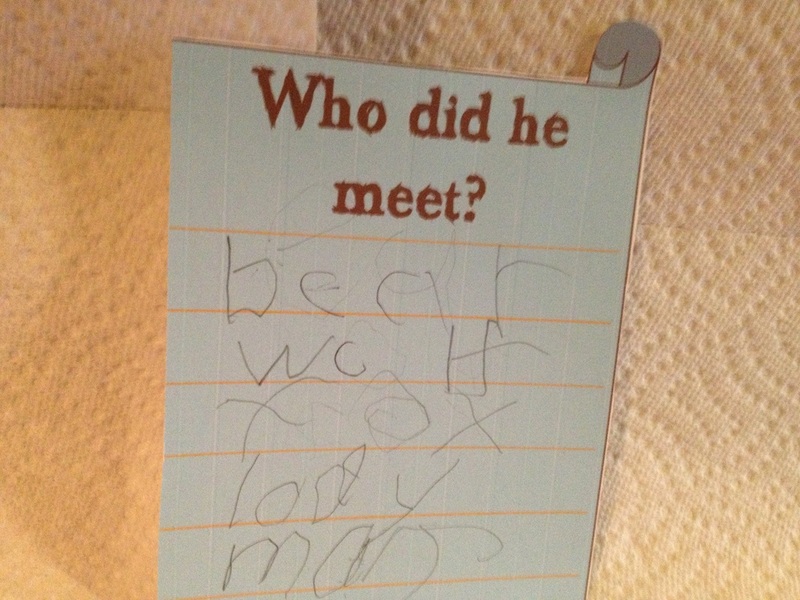 Even though Hope is doing mostly first grade work now, I am leaning towards Kindergarten. Why? It buys some time. 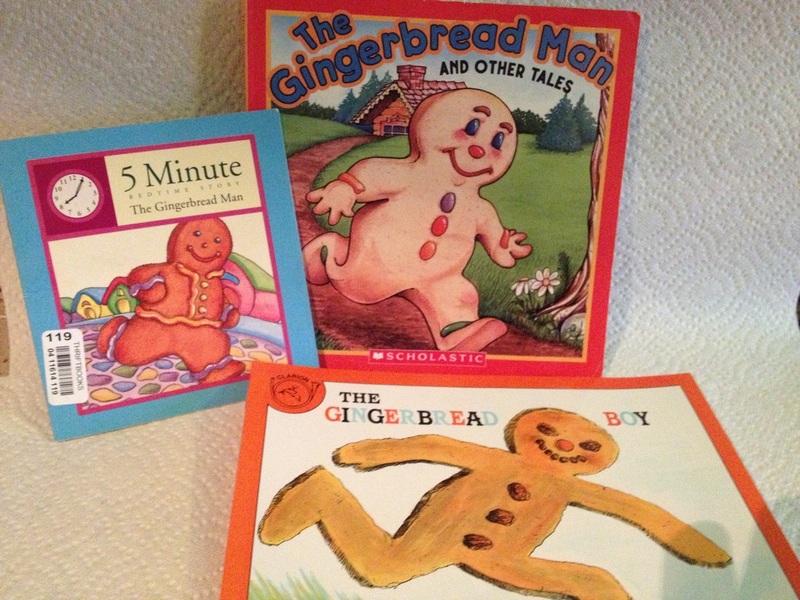 4th grade is the first year when I will have to give a standardized test versus a written narrative. Should she not be a good “test taker”, testing on a lower lever can be a help. In other words, if she is reported as 4th grade but doing 5th and 6th grade work, the test will be less stressful for her. It also allows some breathing room if I should ever want to give her a break or if she, herself should need a break in the upcoming years. I am just finishing up my trip report from our September 2014 vacation to Disney World. Better late than never! Sorry Everyone – it’s been way too long. But our family has gone through a massive amount of craziness and changes over the past months. Unfortunately something had to give and sadly it was my ability to blog and keep up with my Website. But I’m happy to say that I am back and going to make a conscious effort to get going again. I will not attempt to give a long update of the past 8 months, instead I am going to jump right in with our happenings and update as we go along. Before Hope could walk, I bought her a pair of tap shoes. Like so many other moms with beautiful little girls, I imagined her in a fluffy pink tutu gliding magically across a stage and preforming to the roar of the audience. However, after she was diagnosed with Autism - I hid the tap shoes away. They were too painful to look at. All the doctors and professionals gave me a very grim outlook for her future. I would not allow myself to even consider the possibility of her being able to have the dream of dancing. My little girl couldn't speak or look at me or tell me if she had a belly ache... In my mind, dancing became "labeled" impossible - just like so many other things in her life. When her therapist suggested this past winter that Hope maybe try a ballet class, I was skeptical - but I trusted her judgment and knew I had to give Hope a chance. (I am slowly learning that I should never underestimate my children - Autistic or not.) 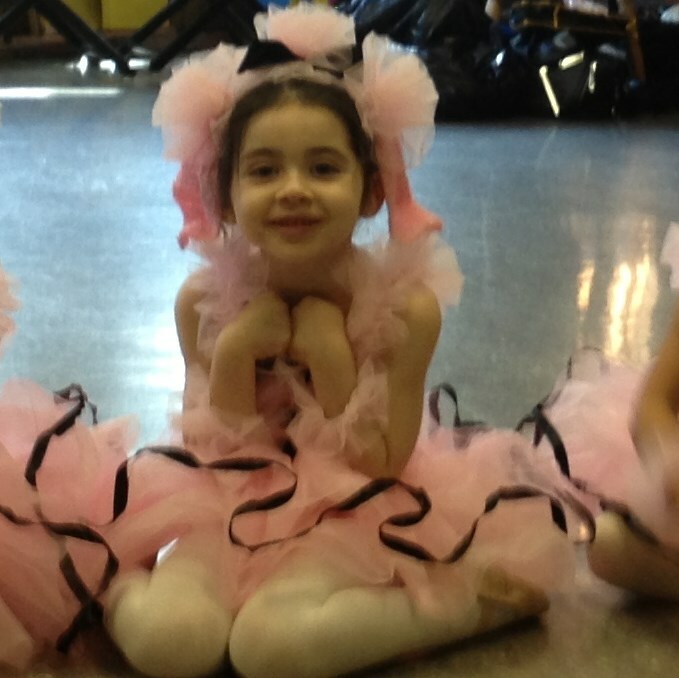 So in January of this year Hope attended her first dance class which was a combination of ballet and tap. From the moment the music started, I witnessed her change - it was as though she was awakened to another world - one outside her world of Autism. The teachers all were amazed at how well she did. She listened, followed directions and she not only realized that they were other children in class with her - but she watched them!! These were all things she had never done before. They all encouraged me to continue, which we have. The dance school she attends is absolutely amazing and allowed her therapist to attend every class with her. Now, every Saturday she wears those same tap shoes to dance class. And what once was a painful reminder of everything that she would never be able to do - have now become the symbol of all that she is capable of - there is no stopping her. 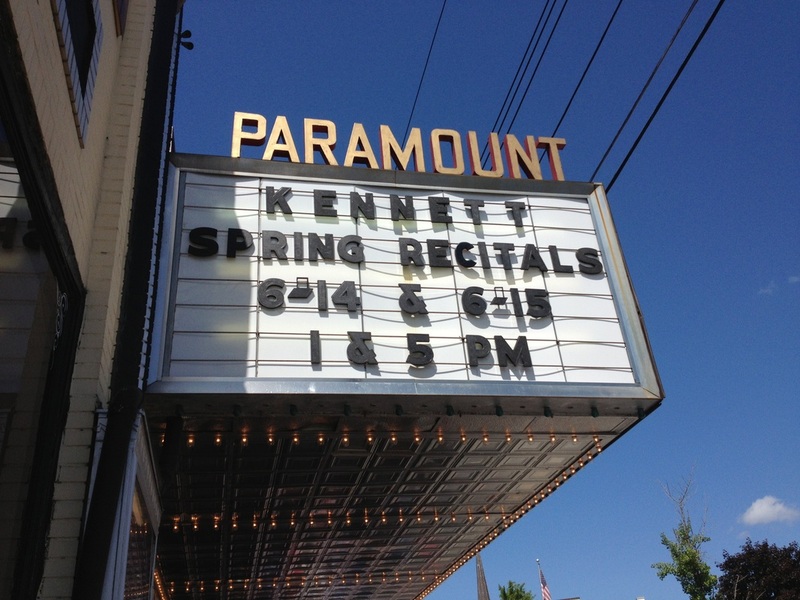 This past weekend, Hope preformed in her first recital. Something only a year ago I didn't think would ever be possible. 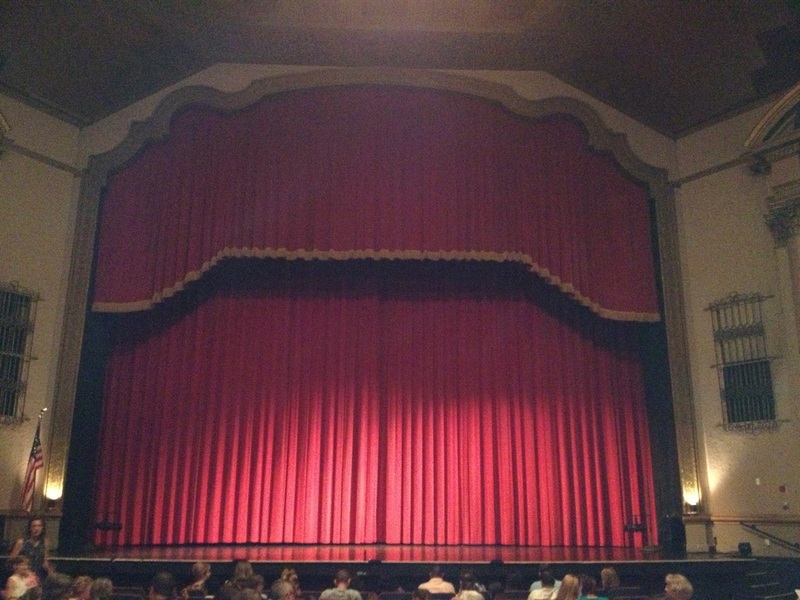 We all held our breath to see if she would be able to withstand all the sensory elements of the theatre and actually do her little dance on stage with her friends. When she did, there was not a dry eye among family, friends and dance teachers. A door to the world outside of Autism has opened. And thanks to a superb dance studio - who are so accommodating to us, amazing teachers & therapists, and the Grace of God, she danced through it. We were not allow to film at the theater, but the following is a dress rehearsal at the studio. Hope is the third poodle from the left with the long thin braid. And yes - she is the one who is leading the others during the middle part. 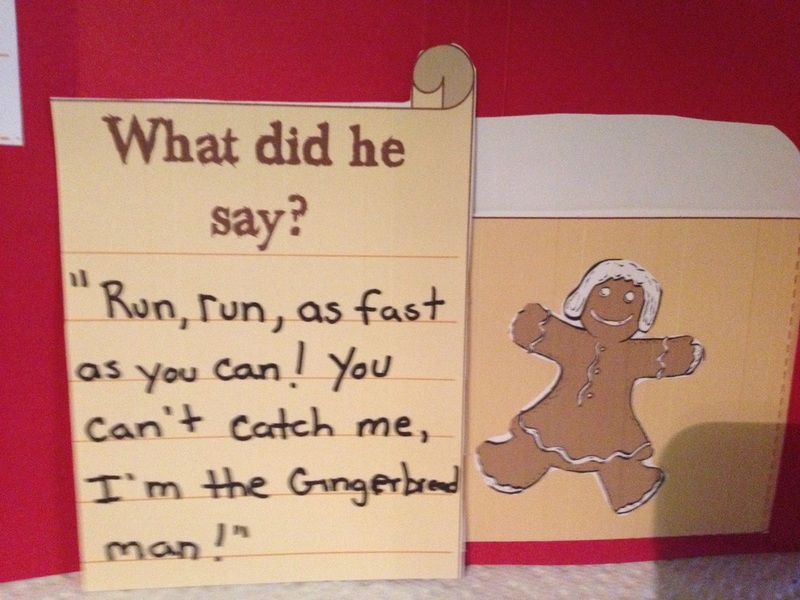 She repeated the directions that the teacher would say, so the others followed her lead. 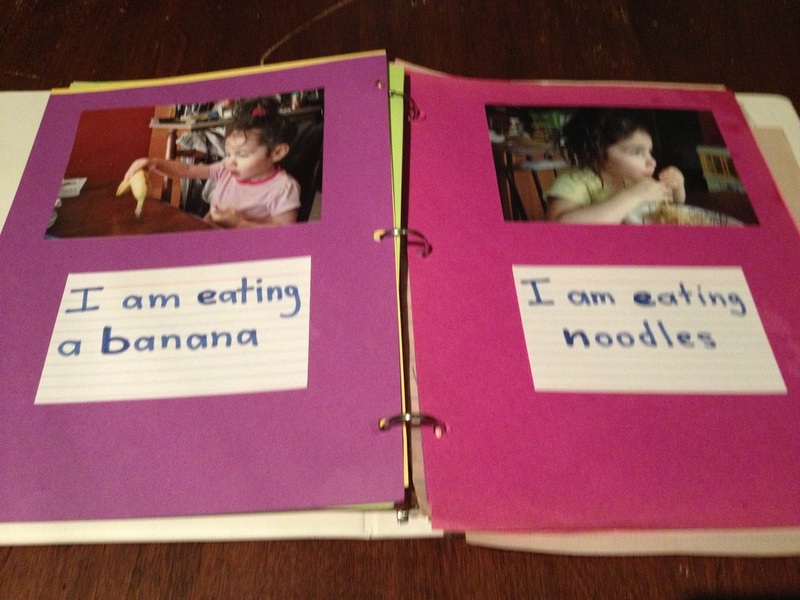 Notebooking For Preschool & Kindergarten? After one week of notebooking, I knew that was the way for us to go. It was amazing to see the spark back in Julia's eyes. Plus - it was evident at the amount of information she was really learning because she now speaks about so many things from her readings and research. 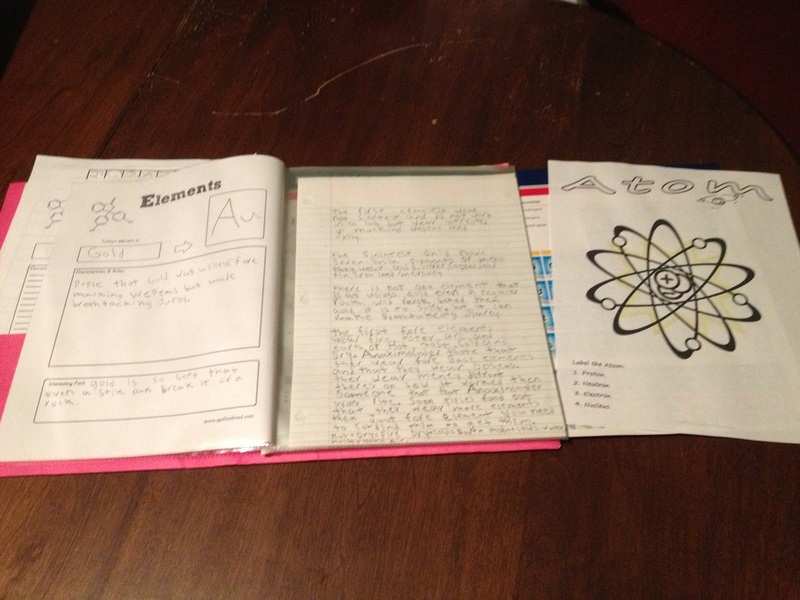 Science is a favorite subject for Julia but I had her bored her to tears with a workbook! 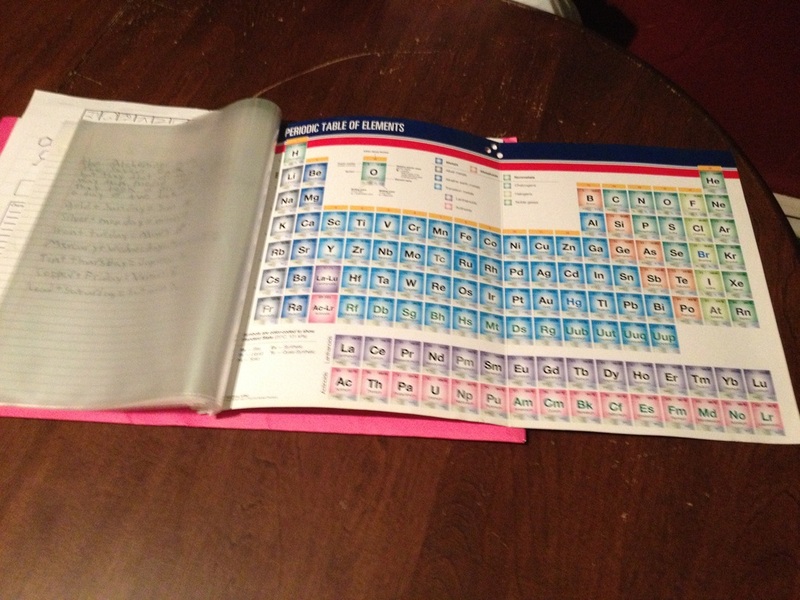 She loves chemistry and we had this book for over a year without even opening it up. 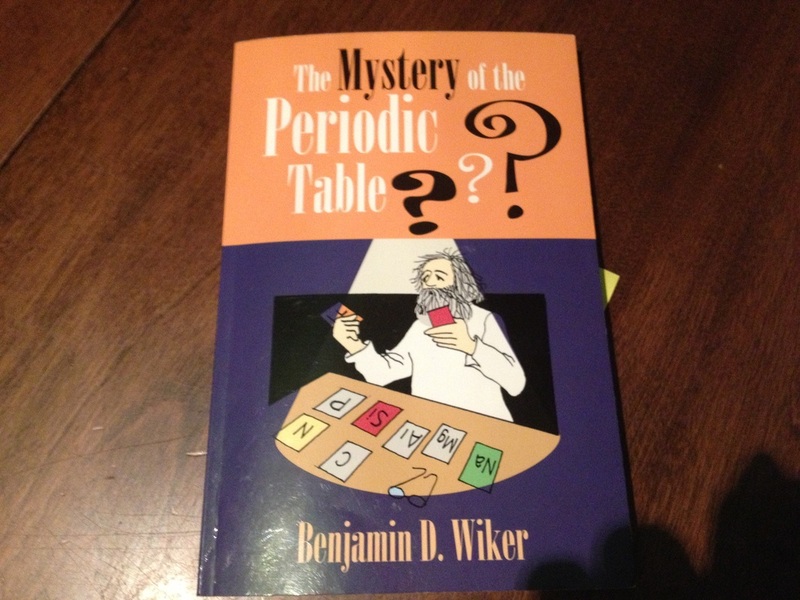 Now she is learning about the periodic table and enjoying it!!! Now my thoughts went to Hope. Is it possible to notebook with her since she is only doing preschool/Kindergarten work? Would Autism be an obstacle to this kind of learning? Then I had a moment of epiphany. 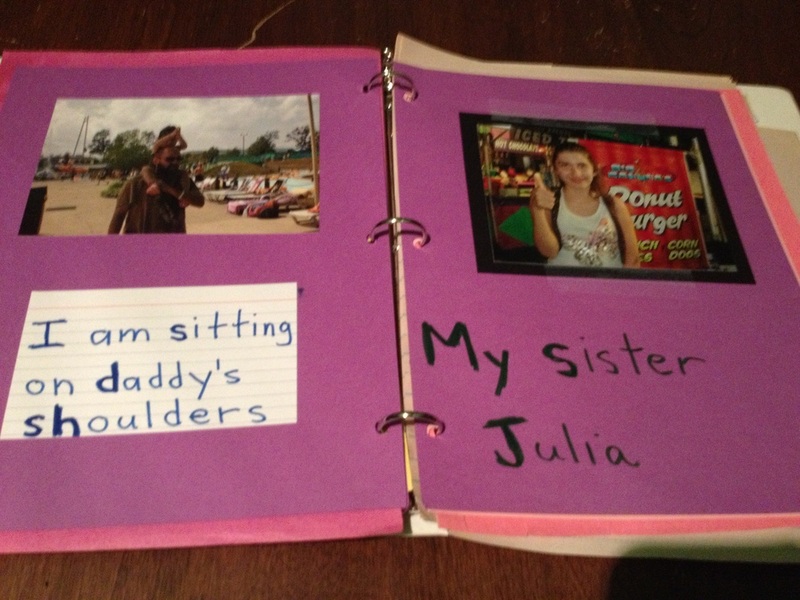 When I was searching for a binder for Julia to use, there were none to be had anywhere in the house. I found it odd - I knew I had a couple of extra ones from last years Staples sales. Where could they have gone? The answer was Hope. 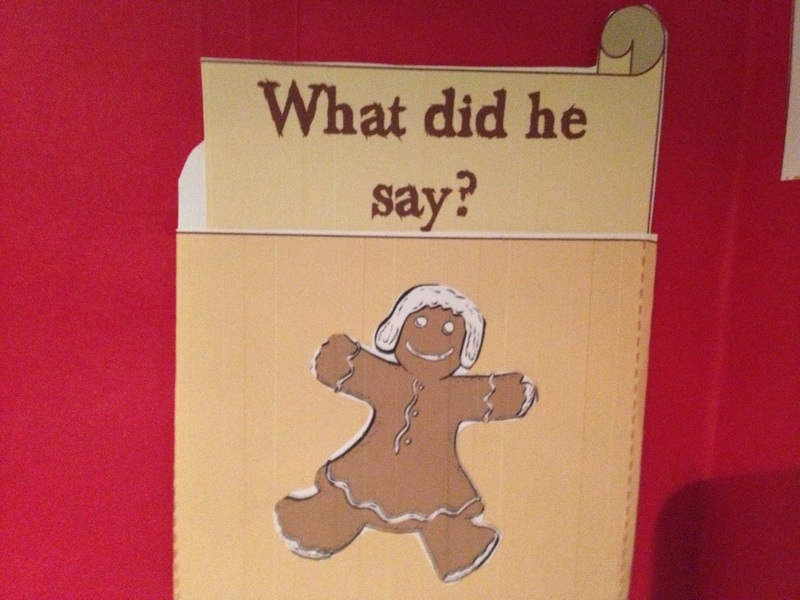 Over the past year, one of her therapists had thought it would be a great idea to have a visual to help her learn language in a very personal way. 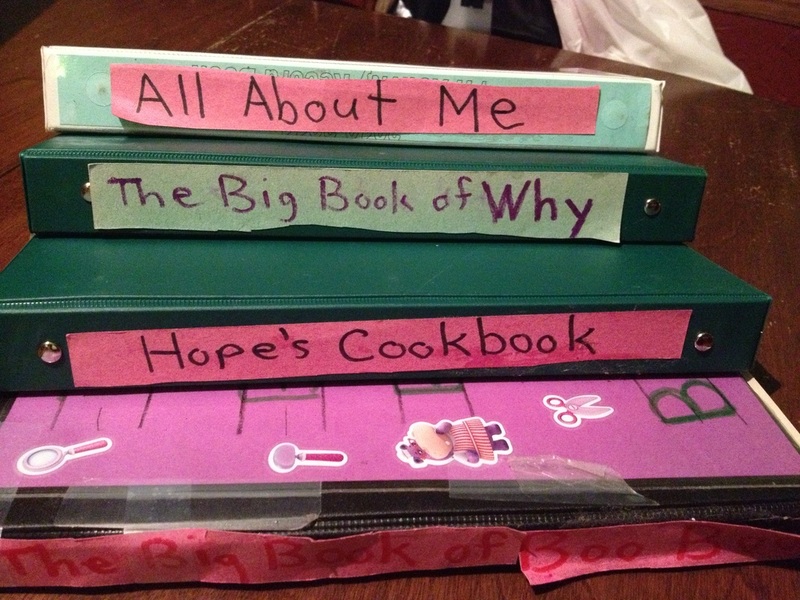 So she started to make up different books for Hope. 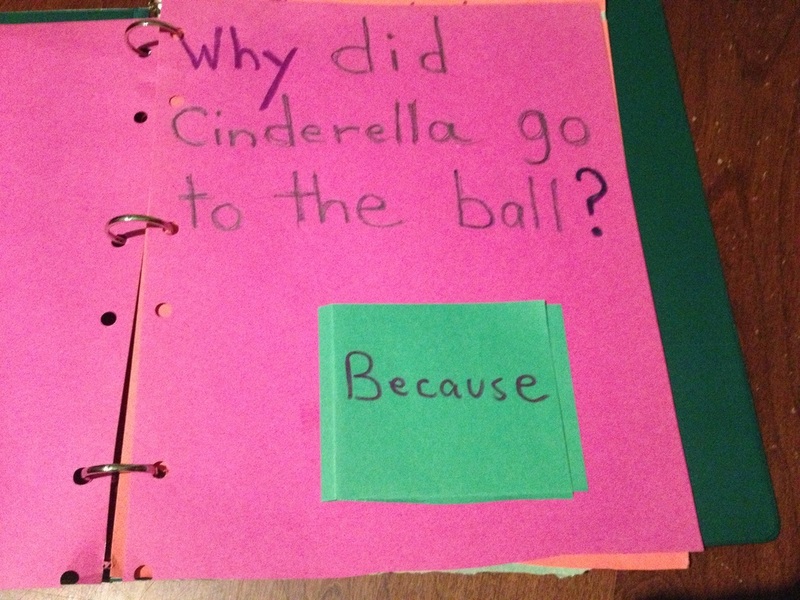 There was the answer to where my binders had gone - as well as the answer to whether she could learn through a notebook system. And the answer was - YES! 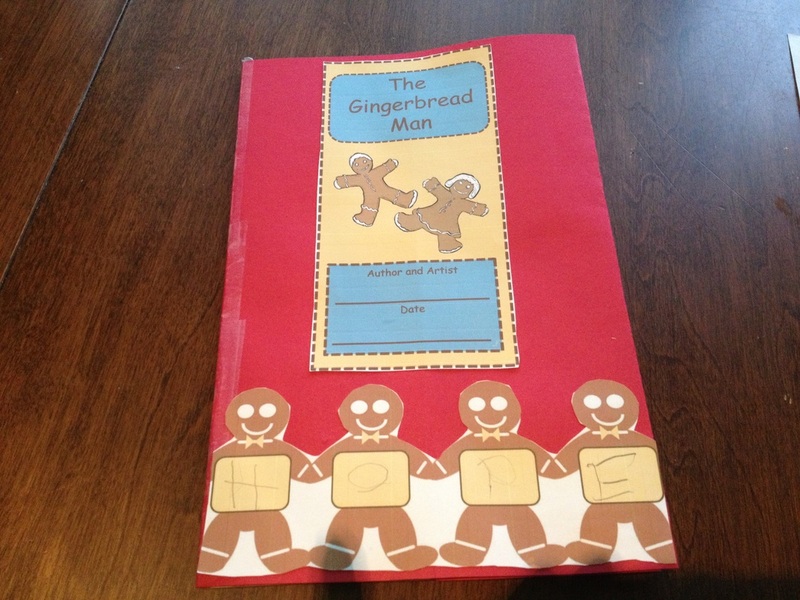 The first book that they created is an "all about me" book. It has some of Hope's "favorites" listed along with her family and friends. 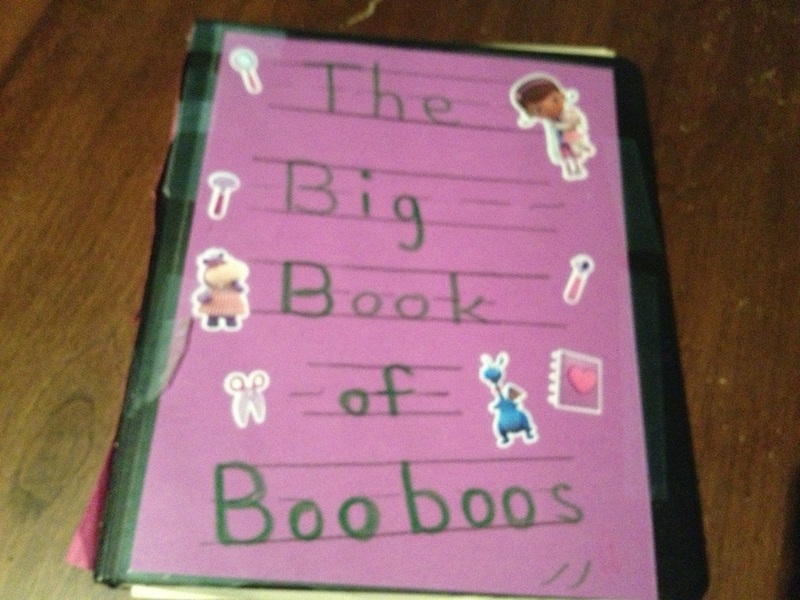 The next book is themed after Disney's Doc McStuffins - The Big Book of Boo-Boos. Hope is not yet able to make her wants and needs known to us - that includes telling us what hurts her. It is a guessing game to say the least trying to figure out what is wrong when I know she doesn't feel well. 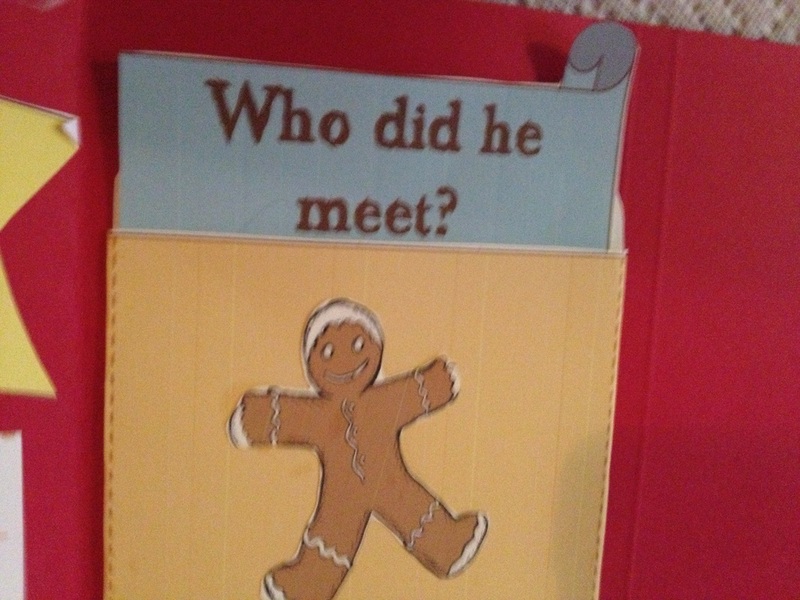 So this book is to help her be able to let us know when she doesn't feel good. 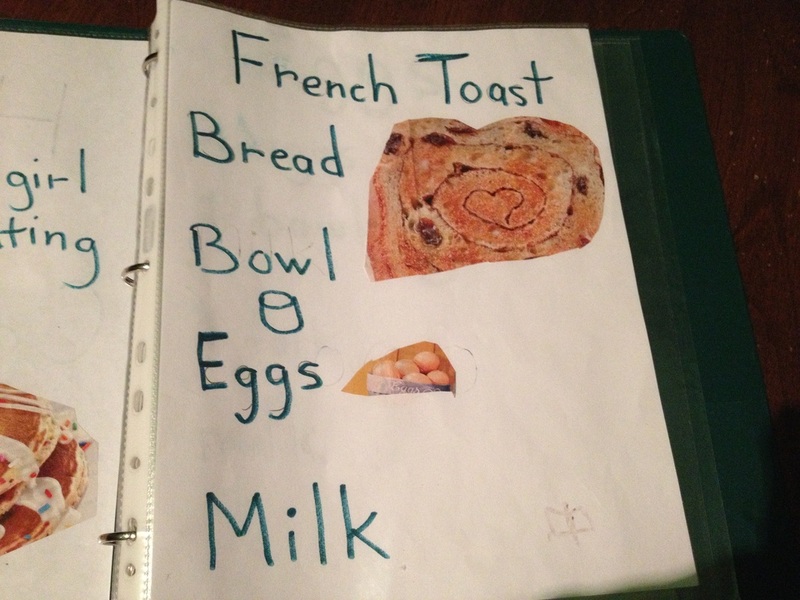 The next notebook is her cookbook. Time in the kitchen is invaluable! We all love to cook in our house and Hope is definitely showing an interest too. She likes to scramble eggs and make French Toast. It's great to share such a special time with her. 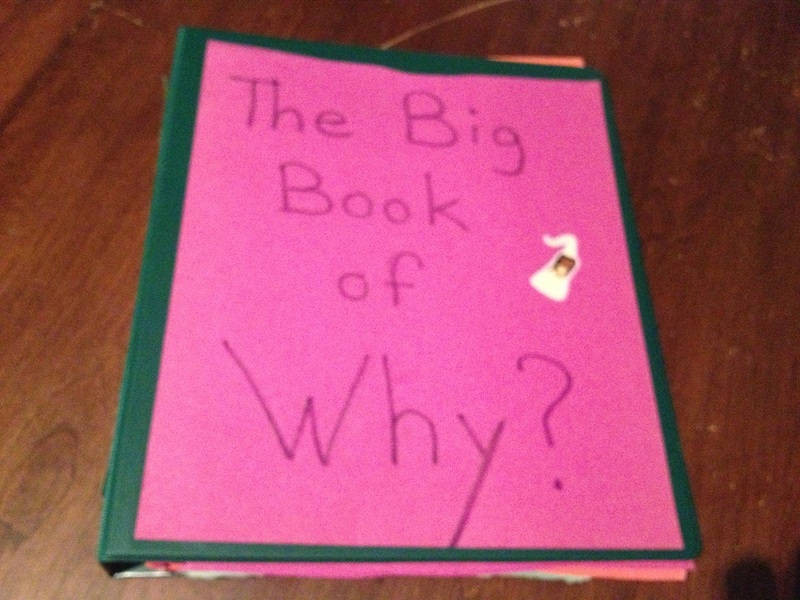 The next book is the latest creation - The Big Book of "Why". Again, Hope can't answer very simple questions yet. 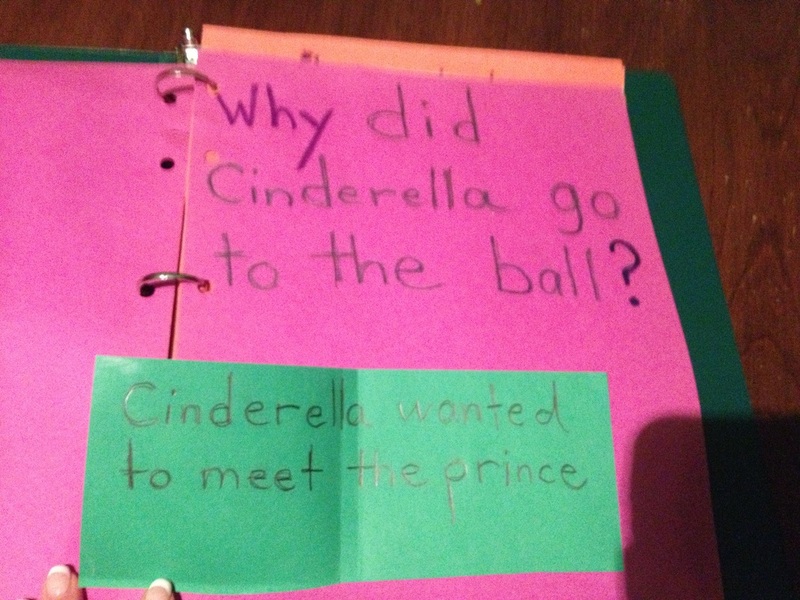 So this book is to help her begin answering "why" questions and introduce the word "because" into her vocabulary. So it looks like notebooking is the way to go for us!!! I'm so excited! Even in the short amount of time we have been using it, I find it amazing what a positive difference it has brought to our homeschool. Okay - so we are a bit out of season, but Hope's therapist started reading this with Hope last week and she loves it. So I thought this would be a great time to start lapbooking with her. It was a really good price - $1.99. I didn’t use everything that was included because I wanted it to be really simple. One of our main goals with Hope right now is to have her answer WH questions. So I thought that a lapbook can be really good practice for this skill. Silly me - I had no idea there were so many versions. 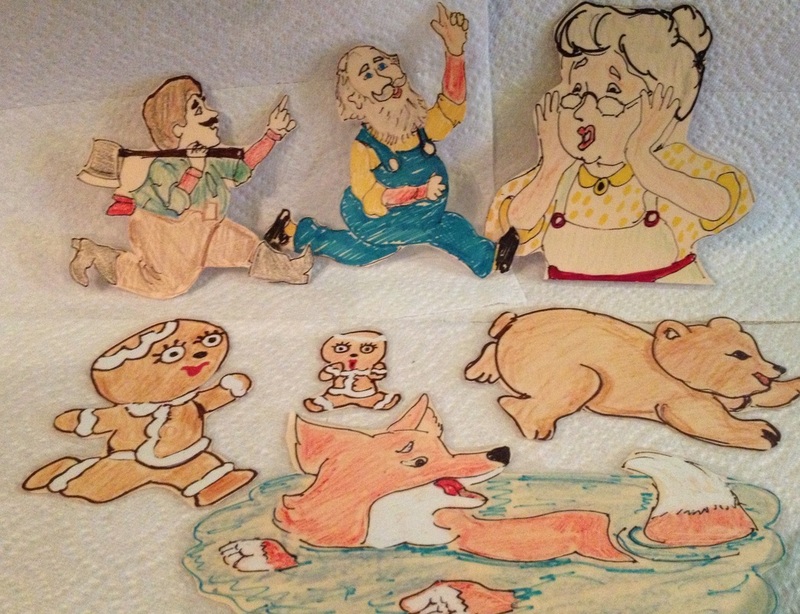 I have a pocket in the back to hold these cut-outs and we use them to act out the story. (They are NOT included in the kit.) Hope LOVES them. They are from Hope's therapist, so I can't give a link to them. 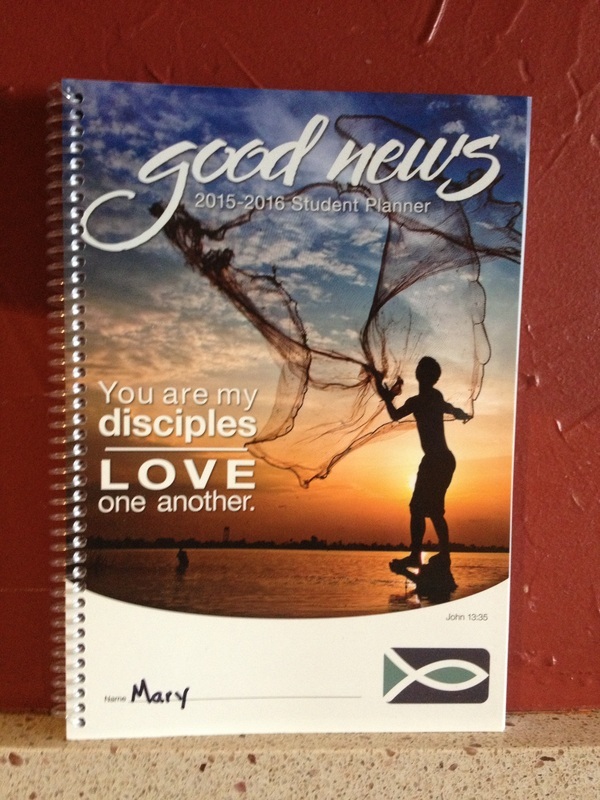 So that's our first attempt at a lapbook. I am thinking we can add to it come the next holiday season. 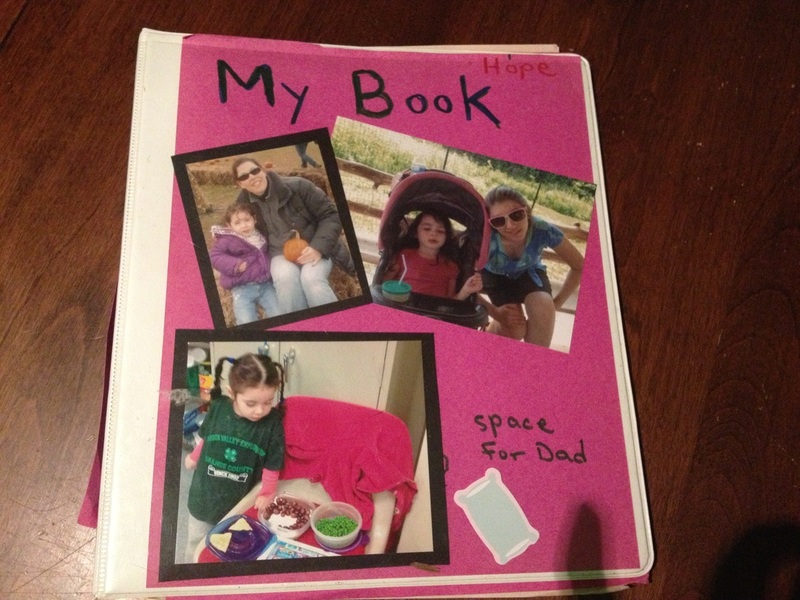 I am a homeschooling mom who lives in New York State and homeschools my 2 daughters. My oldest is 12 and Dyslexic and my youngest, who is 5, was diagnosed with profound Autism.